It was touch and go with my first plant walk of the season, in Inwood Hill Park on a drizzly Saturday. In the end I decided on Go, and went. Most of the people who signed up arrived, bravely. 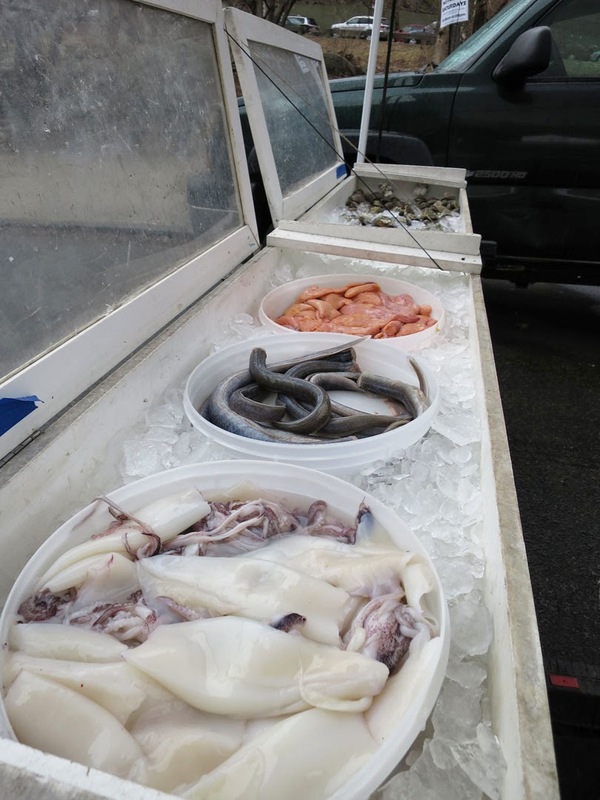 ...and very good looking seafood, including calamari, eels, and shad roe, from the Seatuck Fish Company. 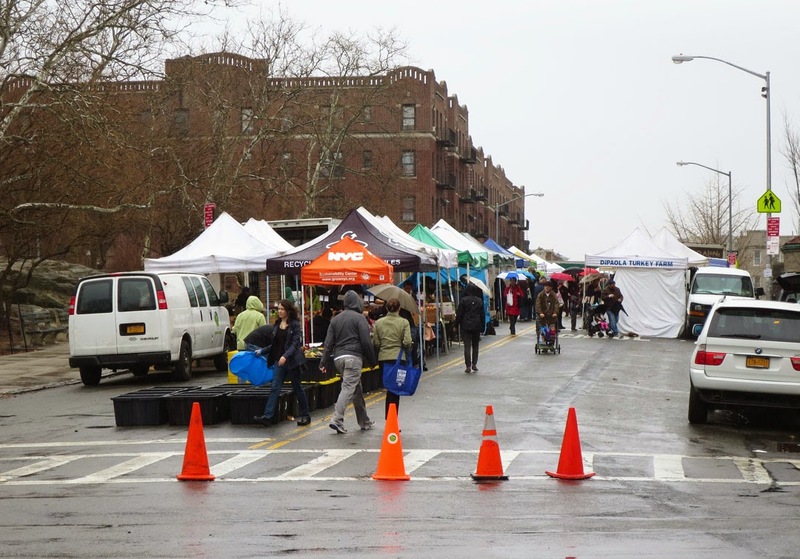 Shad makes me think of ramps, and ramps make me think of the Catskills, and suddenly spring seems very near, and I must start planning weekends around wild foods. 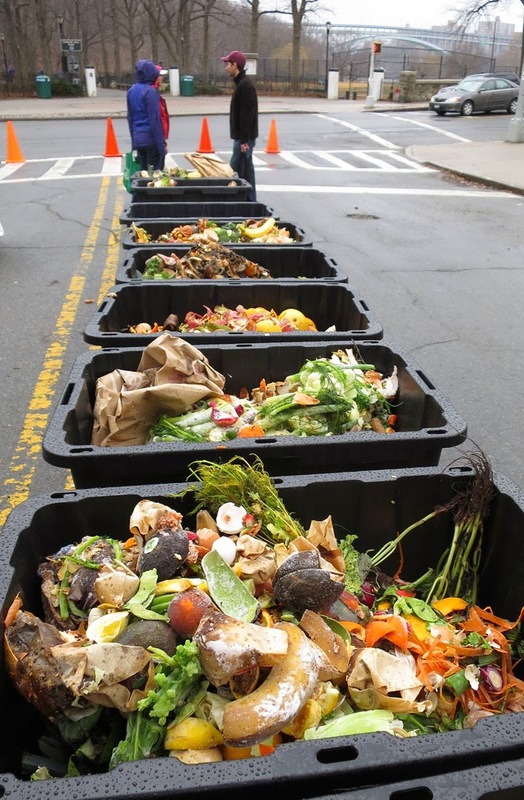 Bins for your frozen kitchen scraps, destined to become city compost. 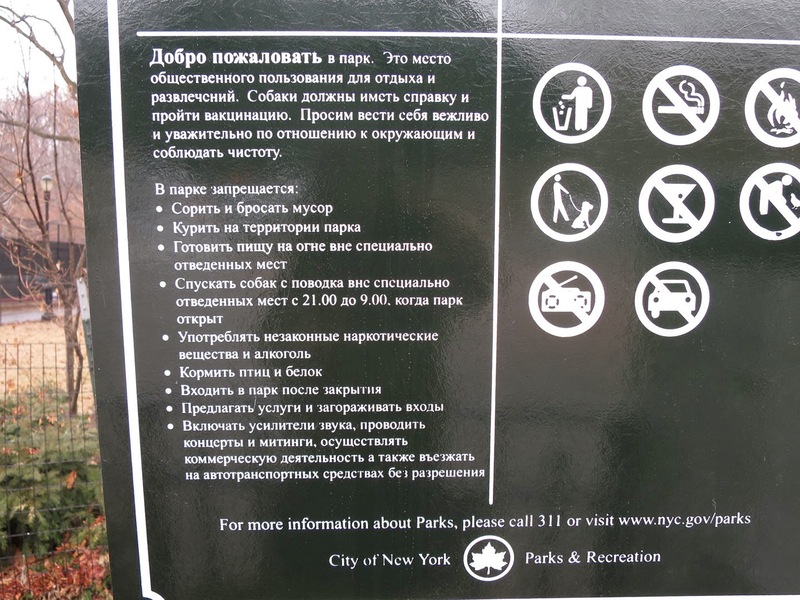 And a new, Cyrillic sign at the park's entrance. I understand completely. Surely Spanish would make more sense in this neighborhood? Curious. And why no martinis? In the park, the forest is waking up v e r y slowly. The spicebush (Lindera benzoin) buds were still closed, but the twigs fragrant. 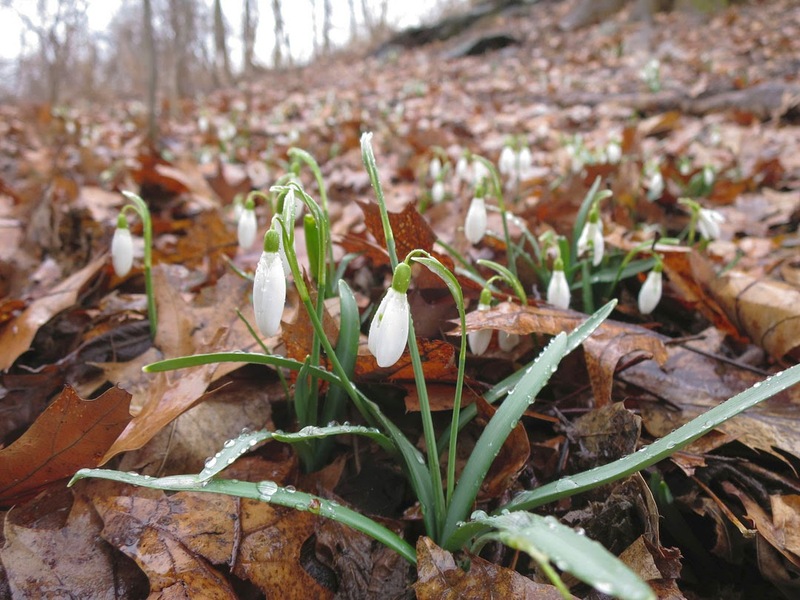 Galanthus nivalis, the snowdrop intruder from Europe, at least gave us hope. As we walked along a path two downy woodpeckers paused just a few feet way from us, quite unafraid. We also saw a red bellied woodpecker (which has a confusingly red head) and a white-breasted nuthatch. 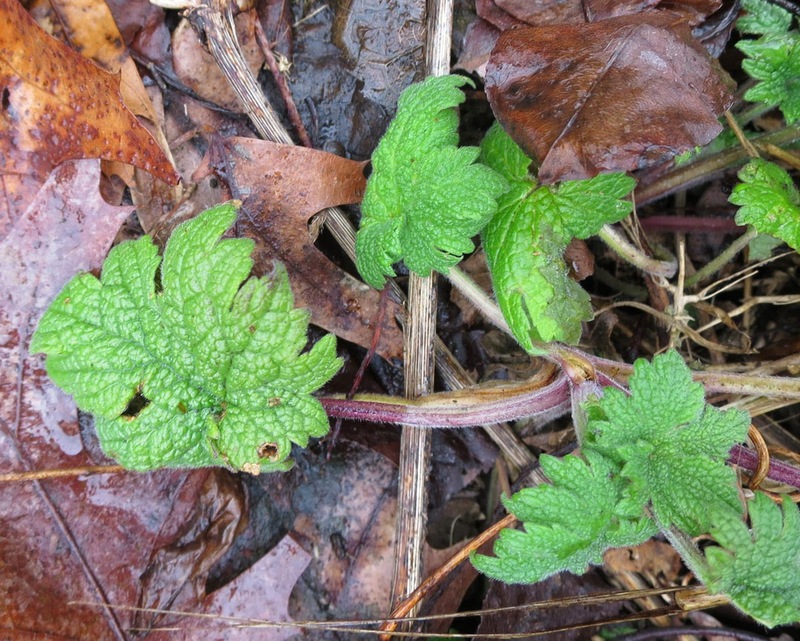 We found lesser celandine beginning to emerge, battered by the unusual snowfall of this winter, about a gazillion garlic mustard microgreens, a couple of early edible day lilies, just emerging, and much evidence of pokeweed. All good signs for later in spring. Towards the end of our botanical tour, and quite a bit wetter than when we started, a sharp-eyed walker spotted these in the woods. 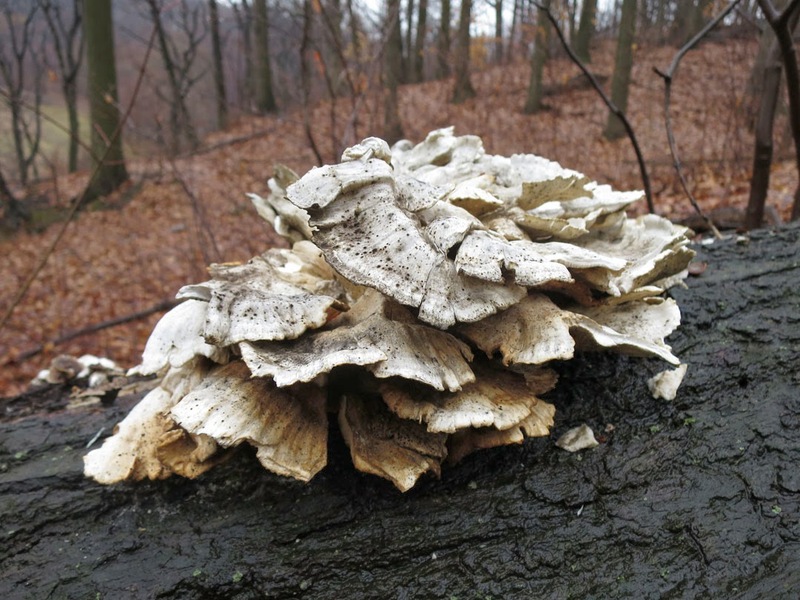 I thought they might be ancient hen of the woods (Grifola frondosa), but it is more likely that they are in fact chicken of the woods. There is only one way to find out, and that is to return in the summer, when there might be fresh, bright orange ones. It would be quite exciting if that turns out to be the case. Because they are dee-licious. A plant I did not recognize at this early stage, below, is motherwort, an invasive from Europe and Asia, in the mint family - Leonurus cardiaca. It grows very tall. Herbalists love it, and also like to disagree about its uses. I think it might be an interesting potherb (a term I like a lot) to flavor Various Things. I'll return over the next couple of months, to find field garlic and garlic mustard, and to see the violets, Solomon's seal and Dutchman's breeches in bloom. 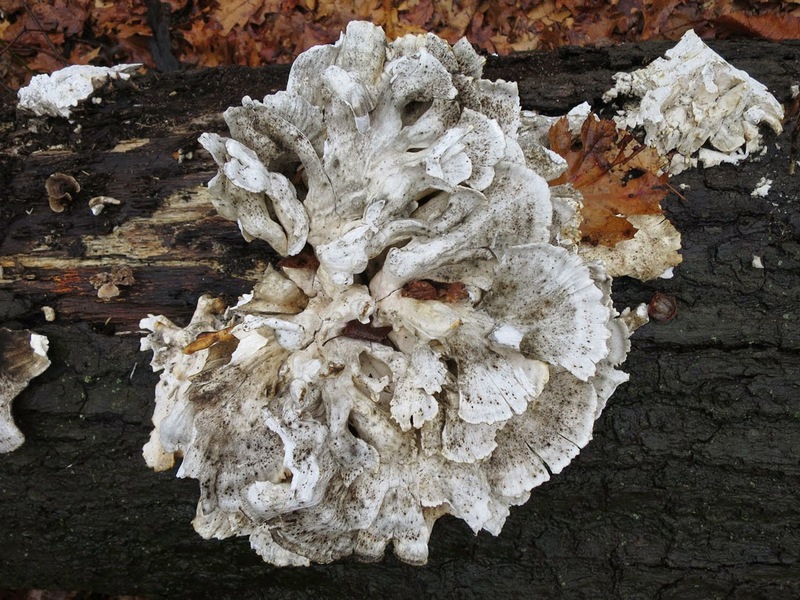 My next botanical walks are: Central Park, April 26th; Pelham Bay Park, May 3rd, and Dead Horse Bay, May 10th. definitely an old chicken of the woods. and definitely come back in the fall, or the fall after. they usually return, or skip a year. The park sign is hilarious. Yes why no martinis? !